How do children learn to share? It is widely believed that children are selfish and have difficulty learning how to share and be fair, but we were curious whether this is always true. In this study, we look at children’s willingness to share with a child they have never met, in order to find out more about how children learn to be generous. To study children’s sharing, we designed experiments in which children have a chance to give away something they like – stickers – to another child. We then change different aspects of the situation to understand what factors affect if, when and how children share. In one version of the study, we examined how the value of a “currency” affects children’s decisions - children selected their favorite and least favorite stickers from a set of four options. 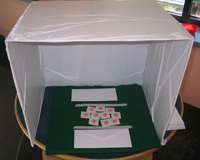 In another version, we looked at how who is watching affects children’s decisions - children either divided the stickers in private (behind a box placed over the table) or while their parents watched. In all conditions, children were told that they can keep all the stickers or give some to a child who would come the next day. Children divided the stickers into two envelopes: stickers to keep, and stickers to give to the other child. Our results showed that children become more likely to give stickers away as they get older, and they are more likely to divide the stickers equally as they approach six years of age. Children of all ages gave away more of the stickers they don’t like than the ones that they like. So personal preference seemed to play a role. But before age 6, children did not seem concerned about who knows what they gave. In other versions of the study, we ask parents to model selfish or generous sharing before children do the experiment so that we can understand how much parents can influence children’s sharing behavior. We also vary how much children know about the recipient of the stickers – the other child. These versions help us understand what kinds of information matter when children decide when to share and how much to give. We also always look at what changes with age and whether the child’s gender or the number of siblings influence children’s sharing. This study is helping scientists better understand what aspects of "generosity" and “fairness” are learned behaviors, and which appear as a natural part of children’s development. These findings may help parents and teachers encourage sharing behavior in children. For more information about this research, contact Dr. Peter Blake, Living Laboratory collaborator and Director of the Social Development and Learning Lab at Boston University. Observe your child as s/he pretends to be a honey bee at the Discovery Center's Fantasy Bee Hive. When playing, does your child share the nectar s/he collects from flowers with other children? How much of the nectar does your child share, if any? How does the relationship between your child and another person seem to affect your child's generosity? Does your child seem more willing to share nectar with you than with someone they have never met? Put two dolls side by side and place eight stickers or checkers in front of one doll and two stickers or checkers in front of the other. Ask your child who they think is nicer. Does your child favor the "wealthier" doll? What reasons do they give for thinking one doll is nicer than the other? Create three stories with your child using six stickers and two dolls as props. Tell your child that the stickers belong to one doll and that the doll is going to share its stickers with the other doll. In one story have the two dolls be strangers, in another story say they are siblings, in a third say the dolls are friends. Have your child decide how many stickers the doll will share in each case. Does your child have the doll share the same amount of stickers in each story? How does the type of relationship between the dolls affect your child’s generosity?